Dance Tour opportunities in California – more than ever before! Dancing in California has always been a favourite for past passengers of Dance Around The World! You might ask yourself why California? Why Disneyland? Disneyland, Disney’s California Adventure and Universal Studios are all going through major developments to include new attractions and new performance opportunities. Universal Studios has now opened its ‘Wizarding World of Harry Potter’ for all the Hogwarts fans! Development continues with a 5 year plan to expand the theme park and filming locations. Disneyland Park sees the return of the Main Street Electrical Parade. The return of this attraction has seen visitor numbers increase making it the perfect time to dance down magical Main Street with Dance Around The World. Disney California Adventure has opened new attractions like Soarin’ and a new World of Colour along with major redevelopment such as Carthay Circle and the popular Cars Land! Dance/Drama/Band/Choir Workshops with Disney Professionals as part of the Disney Performing Arts Program including Dance 101, Dance Master classes, Show Choir and Musical Theatre Workshops. Dance Workshops at Debbie Reynolds Dance Studio and the famous ALDC!! 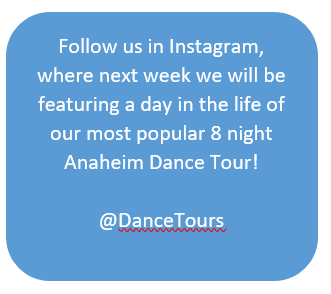 For more information on Californian Dance Tours click here. To explore a range of opportunities including those exlusive to Dance Around The World view our sample itineraries here.